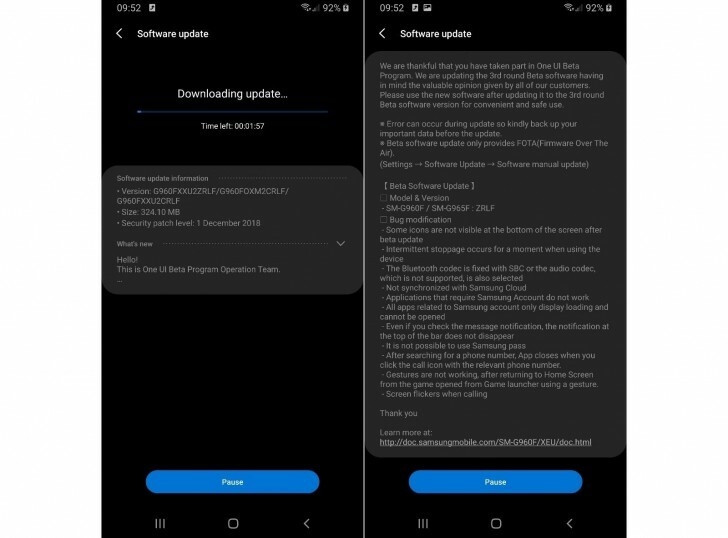 Samsung is now seeding yet another update to its Android Pie beta program for the Galaxy S9 and S9+. It's currently available in the UK, France, Poland, and Germany, and once you install the 324MB file you'll have software version G960FXXU2ZRLF on the Galaxy S9, and G965FXXU2ZRLF on the S9+. It's nice to see the company being consistent about fixing more and more bugs in its Pie builds, as we get ever closer to January, which is when the stable updates should be going out to everyone with an S9 or S9+, and not just those enrolled in the beta program. The latest update takes care of some nasty bugs, related to things such as apps that require a Samsung account not working, message notifications sticking around even after they're tapped, the Phone app crashing when you press the call icon, and screen flickering while on a call. Other markets should be receiving this new beta build in the next few days. If you are in the beta program and haven't been notified about it yet, perhaps go to Settings > Software update and manually check. Take your time Samsung, don't rush and make sure it's polished.